Sea Horsing Around: Boat Project Is Ahead Full Steam! About as powerful as a Sea Horse too? I’ve always wanted a boat. I have thus far been smart enough not to buy one. The saying is: “The best two days of owning a boat are the day you buy it and the day you sell it”. Hopefully I have a better experience because I’ve got an engine to fix up now! With the original tank?! Yussss please! 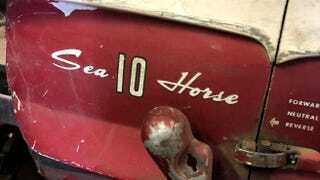 This is a Johnson Sea Horse 10 from what I believe is the late 50's or early 60's. I am not positive. I haven’t had much time to do research. It is a known good running engine that has been stored for many years. I did not grow up in a ‘boat’ family. Once my people got off the potato or turnip boat, we stayed on the land. We haven’t been a sea faring family for many generations. I am looking to change the hydrophobia and get my sea legs (realistically putt’ around a pond and catch some perch). I’d like to do some occasional fishing, but mostly leisure drives around a lake, picnic on the beach, and maybe some shore camping. Wouldn’t that be the life? Now I need to buy some boat shoes and a Buick. Lean? High? High speed? I need a crash course. It is in a complete condition with tank. It doesn’t appear to me to be modified or known to be dicked-off-wa’hacked-back-together or anything else. Seems to me it could be as easy as a carburetor rebuild, tune up, and cut the top off a 55-gallon barrel for a test. Anyone know much about outboard motors or have any suggestions about the best place to buy parts? Amazon has a carb rebuild kit for a hilariously low price. Once this motor is fixed up - hopefully for cheap - I’ll be buying an affordable used aluminum boat. That will be another adventure. Prices seem to hover around $500 for something that doesn’t leak with no accessories. I’m thinking a couple seats, Bimini top, and current paper work would be a delight. Let’s hope I can do this soon!